The BA300 battery monitors the DC auxiliary supply to ensure the continuous integrity of electrical equipment. Many substations are required to provide both DC supply for protection and control equipment and trip and close currents to breakers during trip conditions. BA300 monitors the performance of the DC system, which is fundamental to safe, reliable and efficient substation operation. The BA300 provides comprehensive, continual monitoring of the battery and its condition and signals an alarm in case of danger. It can also provide trip and closing current to circuit breakers. The BA300 monitors critical DC operated systems. It ensures the efficient operation of substation equipment, which includes making sure the battery charger is operating properly. 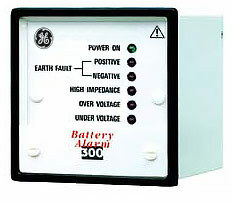 When battery circuit impedance exceeds safe operating levels, it triggers an alarm. Consequently, efficient maintenance strategies can be put in place to ensure maximum security within system operations.